The view after entering the house and stepping toward the living room is surprisingly expansive. A corner window with an 'L'-shaped built-in brick planter catches your eye immediately. The fenestration clearly suggests sliding Shoji-type windows. The asymmetrical arrangement of mullions emphasizes this horizontal orientation. In reality, the corner is formed from two fixed plate glass windows with a double hung window at either side. The mass of brick over the main hearth continues this suggestion of sliding forms, only here it appears as a solid, heavy form surprisingly floating over the fire. Along the base of the planters are perforations in the masonry allowing for heated and cooled air to be circulated within the house. The planter appears to have been slid out from below the brick mass to create the void of the firebox. In doing so, it formally, but subtly, relates the actual source of ventilation with a home's traditional heat source. All of this horizontality isn't terribly surprising given the form of the exterior. However, the multiple planes comprising the ceiling here come as somewhat of a shock, particularly the double set of clerestories admiting light from above. This method of admitting light into the space creates a sublime mixture from the horizontal spread of the Prairie Style with some unexpected, hidden openings to the sky reflecting off the ceiling's angular planes. Armstrong's design of 1939 for the home of Dr. Roland Stuebner. The faceted ceiling allows sunlight to pour into the interior through clerestory windows. While the overall house presents a Prairie Style from the exterior, the interior layout and design is more eclectic in its sources than suggested by the overview of the house. Here Armstrong makes the focal point of the living room the large corner windows. Characteristically, he places an indoor planter along the window, perforating the lower portion to allow for air ventilation. The relatively simple composition of brickwork relates the void of the fireplace to the base of the planter and the projecting rectangular mass above to the openings at the windows. This brick volume appears to be sliding to open the view outward. A low brick bench completes the composition as a disposition of rectilinear masses in space, akin to the formal inventions of the Dutch de Stijl movement. The angular planes of the ceiling float above the horizontal soffit that ties the various elements of the room together. The light from above and contrasting geometry gives the house an unexpected air of floating and dematerialization. In that regard the vaulted ceilings and clerestory windows provide a clear feeling of a stylized sky. 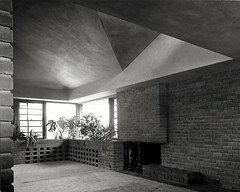 The brickwork, plants, fireplace, and view outward are clearly grounded and of the earth. The step in the soffit which divides the lower walls from the upper ceiling makes the reconciliation of such disparate geometries possible. This house was located on five acres adjacent to the Log Cabin Country Club's golf course in Ladue, Missouri. Unfortunately, this house (along with its extensive landscaping, mature stand of trees, paved patios, and built-in fountain) was purchased as a tear-down, demolished, and replaced by a faux-Tudor McMansion.